Most alarming is the use of intimidation by the activists toward pipeline employees. When a rational person knows they aren’t going to win, that their point isn’t going to be heard, that they came up short – they throw in the towel. Sure, a toddler may continue to whine and cry, but an adult moves on. There’s a time and a place to protest, to stand your ground. But when a decision is final, most rational people will give up. So when it comes to the Dakota Access Pipeline Project, when is enough enough? For context, the new Dakota Access pipeline stretches nearly 1,170 miles from North Dakota’s Bakken and Three Forks production areas across South Dakota, Iowa and Illinois. When completed, the pipeline will transfer 470,000 barrels per day, with a capacity as high as 570,000 barrels per day or more. That could represent approximately half of Bakken current daily crude oil production. In addition to strengthening US energy security, a primary goal of the project is to reduce costs for energy intensive states like North Dakota, South Dakota, and Iowa – all states that rank among the top ten energy consumers in the country according to the Energy Information Administration (EIA). Currently, however, the Standing Rock Sioux tribe is protesting the pipeline’s construction in North Dakota. Protesters have gathered near the construction site since April, but recent surges in numbers have left local law enforcement struggling to protect the safety of the workers. Developments out of the protestors’ encampment are disturbing for several reasons. Most alarming is the use of intimidation by the activists toward pipeline employees. Protesting is nothing new to large energy projects like Dakota Access, but no difference of opinion grants protestors the right to endanger pipeline workers simply doing their job. At no point – repeat, at no point – did protestors make their voices heard during the two-year review and comment period by the North Dakota Public Service Commission (PSC). As PSC Commissioner Brian Kalk said, "I would just put one point out there: we had these hearings, these groups didn't come to our hearings so that in itself is disappointing with what they're doing now." Further, the tribe claims that the US Army Corps never consulted them on the project. In court filings, however, the Corps notes there have been almost 400 meetings on cultural surveying results and 11 meetings between the US Army Corps of Engineers and Standing Rock Sioux Tribe. What’s the definition of “meaningful consultation” if this prodigious number of meetings doesn’t count? 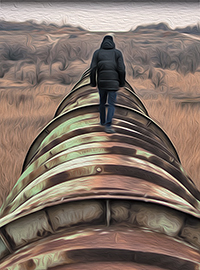 Moreover, pipeline construction is currently underway and already at 63% completion in North Dakota. Activists had the chance to voice their concerns during the nearly two-year regulatory approval process, so they've got no excuse for resorting to intimidation and disruption rather than due process. As Julie Fedorchak, Chairwoman of the PSC said, "They have a right to disagree. They don’t have the right to threaten. They don’t have the right to obstruct."